Back in March of this year, the FTC announced that ADT, the home security company, would not be allowed to misrepresent paid endorsements in the form of independent reviews. The FTC, Federal Trade Commission, has approved a final consent order settling charges that the home security company ADT LLC misrepresented its endorsements. ADT paid safety and technology experts to go on news programs and talk shows as ‘guests’ to endorse ADT and its products. The FTC settlement prohibits ADT from paying experts to go on TV as “guests” to endorse ADT. 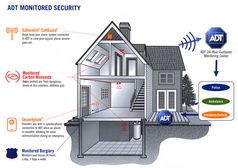 Before the settlement, ADT was not showing in these advertisements that the experts were paid endorses so the audience believed that ADT was the best choice for home security. Also in the settlement, ADT was hit with new regulations to follow when using paid endorsements. ADT must clearly disclose any connections in advertising and endorsements that have been misrepresented as independently provided by an impartial expert. This means that ADT will be required to prominently display any and all advertising connection regarding monitoring equipment or services. ADT must also remove any reviews and endorsements that were in any way misrepresented as independently provided. AFter the hearing, the FTC Commission voted to approve the final order in a 4-0-1 fashion. All four present committee members that were present, voted in favor of the settlement.